Herbalism is something I’ve been interested in for a long time. My grandmother used to be an avid gardener and herbalist (age has slowed her down a bit). As a child, she wowed me with homemade creams, herbal teas, and sachets. Despite her strict Catholicism, she would always laugh when I called her a witch doctor. She still shares her knowledge with me, whether through specimens she’s pressed, books she’s passing on, or walks through the garden. She’s really inspired me to study the art myself – albeit in a different direction than she ever imagined. She would probably blame my genealogists grandfather, with all his talk of ancestors and Ireland, for my conversion to Druidism. At this point in my life, I’m still very much a novice herbalist. I’m just becoming comfortable growing some of the basic varieties and am starting to branch out into some unknown territory. Over the past couple years I’ve experimented with making oils using extraction, salves using beeswax, smudge sticks, and herbal steams. Tea, one of the first herbal skills I learned about, continues to be one of the main ways I work with the plant folk. 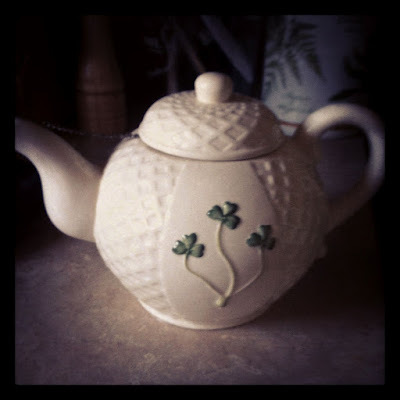 It took my old friend and kitchen witch Imagickat to teach me how to turn tea into a magical practice. It’s a loving process of learning the medicinal and magical properties of the herbs, mixing them in pleasing ways, then utilizing them practically – often with prayer and intent. I posted yesterday about my poor sick husband. He’s very rarely sick, but when he is I get a chance to practice using my skills on another. Today I made him some tea specifically for sore throats. 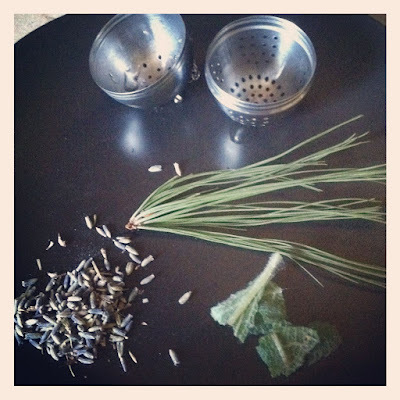 I used white pine needles for their many healing properties. I added some sage which is known for fighting sore throats. Finally, l used some dried lavender to help relax his headache. I placed them in my great, great grandmother’s tea ball and put that in my favorite teapot. I poured water over it, let it steep, and voila! My sore throat tea. The liquid will be a light green to clear depending on how many herbs you use. The lavender gives it a subtle, spicy kick. For further flavor and healing, I added a spoonful of local, raw honey and some lemon juice. Can you recommend some good resources for beginning to study herbalism, particularly herbal teas? It’s hard to distinguish the fluffy books from the practical ones sometimes, and it’s definitely something I’m interested in learning about! One of the first herbal books my grandmother gave me is called “The Way of Herbs” by Michael Tierra. It’s pretty extensive. The most recent book she gave me, that I enjoy quite a bit, is “Herbs, Health, and Cookery” by Loewenfeld and Back. It has more practical uses like steams, teas, etc. There are also several recipes so it’s very good for kitchen magic. They don’t have pictures, really…but they’re a good start. I finally have a pot of established lavender. I lost the last bit I had. It suddenly seemed sick then just went. This plant is healthier. I have echinacea too – have for a couple years. I know it’s the root used in herbalism but I’ve never had the heart to dig it up. I’ll have to research and find out if it’s possible to replant some of the root to produce more. I haven’t had the nerve to dig it up either–especially because I love the purple blossoms so much that I want them to keep coming back every year! I know I’ll have to get over it sometime though and do some digging. Maybe this year?